Jonathan Simon (ECE/Biology/ISR) has been promoted to the rank of full professor by University of Maryland President Wallace Loh, effective July 1, 2014. Simon received his Ph.D. in physics from the University of California, Santa Barbara in 1996 and did postdoctoral research in theoretical general relativity (University of Wisconsin-Milwaukee, and University of Maryland) before embracing the field of neuroscience. 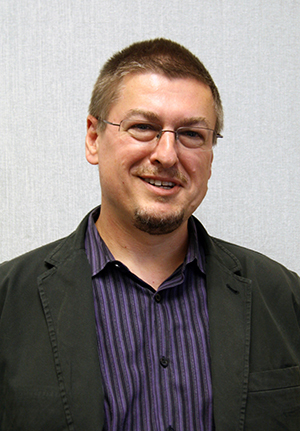 Simon joined the Electrical and Computer Engineering Department in 2001 and the Biology Department in July 2002. He was an affiliate faculty member of the Institute for Systems Research until 2013, when he received an ISR joint appointment. Simon is co-director of the Computational Sensorimotor Systems Laboratory (CSSL) with Timothy Horiuchi. CSSL focuses on the investigation, modeling and implementation of biological sensorimotor systems for both scientific and engineering purposes. Simon's research focuses on neural processing in the brain's auditory system, from specialized processing found only in humans (used in speech processing) to generalized processing found in most mammals, including sound localization.